I found this photo on The Organic Mom’s FB page, she doesn’t recall where she found it (if anyone knows please share), but you could always make your own. 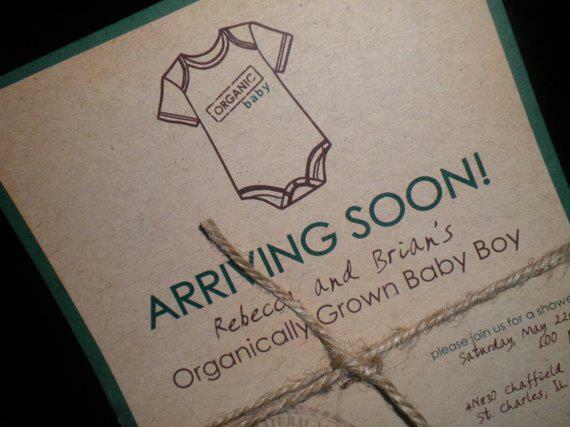 What a GREAT way to get the message out about your organic baby right from the start!! A mission was started to try and find the safest baby items, preferably made in the USA, for mama’s to put on their baby registries. It can take countless hours and frustration as an expecting mama to go through the infinite material on the internet and try to decipher what is safest for their little one(s). I asked these questions (in order of importance) when searching for products to add: “Is it safe and free of chemicals?”, “Is it made in the USA?”, “Does this somehow support a local small business?” We all love organic, USA made, baby items but they are not always available in every category. My mission was to have a well-rounded list. I wanted this list to be comprised of things that were easily available such as larger name brands, and I also wanted to make sure that there were items that supported local farmers and small business owners from mama’s (and papa’s), just like us. In the categories where there was no Made in the USA option, I opted for the safest/best option, even if that option hailed from overseas. Everything is labeled so you will know which items are USA and which are imported. We will be adding to this list as we find new things. Go ahead and check it out. I bet you will find some things on this list that you did not expect that are free of toxins AND made right here in the good ole’ USA!!! *Some items are not made in the USA because I could not find another option when I looked. **Please, as always, double check items before you buy. Sometimes companies change materials they use and where they make them. We try to keep the list as updated as possible! We will be continually updating this list. If you find something that is no longer made in the USA, made with new offending materials, and/or you find something that is now being manufactured here or now a safe product – let us know! The more we know, the better we do! ***We are by no means suggesting you need all of these items. As mamas ourselves, we remember what it was like to be a 1st time expecting mama and wanting to get “the nest” in order. We want you to have lots of options, and make you aware of some of the offerings on the market. Often, you have no idea what baby will like until baby gets here. It doesn’t hurt to be prepared. Also, if you are on a tight budget, this list can help you get an idea of name brands that are desirable, then you could search Craigslist or you local online bulletin board for used options, which is both budget- & environmentally-friendly! Orbit Baby Stroller Travel System G2: PVC-free rain-shield, free of flame retardant chemicals, organic upholstery. This is the safest stroller/carseat combo that can be found thus far. However, it is manufactured in China. Graco Ready2Grow Stand and Ride Stroller (Metropolis only), Graco LiteRide Stroller (Pasadena only-update, a Mama has told us this is now made in China, check with Graco to double-check…) were the only ones that I could find that were Made in USA, rest were from China. Chicco, Evenflo, The First Years, Combi, etc: either place of origin could not be confirmed due to conflicting information or it was found to be from China. ALWAYS CHECK: HealthyStuff.org this is going to be your best friend when it comes to seeing the toxic levels of your car seat. As most products are made in China the best thing that you can do is to find the least toxic car seat and then to air it out in the sun (even if you get it used) to help ‘off-gas’ some of the chemicals….even if it’s rated low…better safe than sorry! Baby Hawk: These are mama made Mei Tai styled baby carriers with a variety of designs. www.babyhawk.com. Jess’s review: https://ecofriendlyusa.wordpress.com/2013/09/21/babyhawk-mei-tai-review/. Action Baby Carriers: Very similar to Ergo, with many cute patterns available. A lightweight soft structured child carrier offering a very comfortable and supportive way to carry your baby. We love their stylish prints and elegantly simple design. They are great for both infants and toddlers, front or back carries, moms or dads.http://www.twocrowsforjoy.com/index.php?l=product_list&c=34. Jess’s review: both infants and toddlers, front or back carries, moms or dads.http://www.twocrowsforjoy.com/index.php?l=product_list&c=34. I have found WAHM companies that make a moby style wrap that are made in the USA and with organic materials. Pure Play Kids has several organic offerings! Kleynimals also makes baby keys, and the liberty brand makes the only adult stainless steel flatware made in the USA. Thank you so much for this. This list is awesome!